This entry was posted in CCF and tagged 1980s, ccf, COMPO, otc by rossjamesparker. Bookmark the permalink. It was certainly the RAC cap badge already in 1962, when I went with the CCF to the BAOR base at Fallingbostel in Germany, and rode on a tank with the Royal Armoured Corps. I don’t recall any other cap badge than that mailed fist. Many thanks as that takes the date back a further decade than I had previously found evidence for the use of the RAC badge. There was a photo in the Bournemouthian from c.1974 with cadets in some very unmilitary 1970’s haircuts and the RAC badge. I’ve just unearthed my cap badge today. I’m unsure what material it’s made from but it is not very shiny and it doesn’t look like aluminium. It does have a Queen’s crown rather than a King’s crown. If you send me your e-mail address I can forward a picture if you wish. Further to my earlier comments about the RAC cap badge I also have a Royal Hampshire cap badge; this one has a King’s crown surmounting it. I’m sure that somewhere else on this site I have seen a reference to the CCF using the Hampshire Regiment cap badge so I wonder if the badge was changed at the time of the coronation in 1953. I’m not sure how I came by the Hampshire badge but I was Assistant Quartermaster in 1961 to 1962 so maybe it was still in the stores at the time. In 66 I was issued with a shiny non-clean RAC cap badge with a lacquer or plastic coating. Still have it somewhere. I think it was a new issue that year, very new. Remember Geoff Giles, possible from Scouts also? Hi Malcolm! Yes, I remember you, but more from the 3rd Bournemouth Scout Troop, I think, than from school. I do have a couple of photos of the CCF in 1963: the Inspection Day, and a Field Day. I’m not sure whether I can just drop them into this comment box. I think I have to contact the webmaster. The Hampshire Regiment cap badge was changed before the Coronation in1953 as the regiment was granted the title of Royal Hampshire Regt I 1946 and the badge changed as a result of that new title. 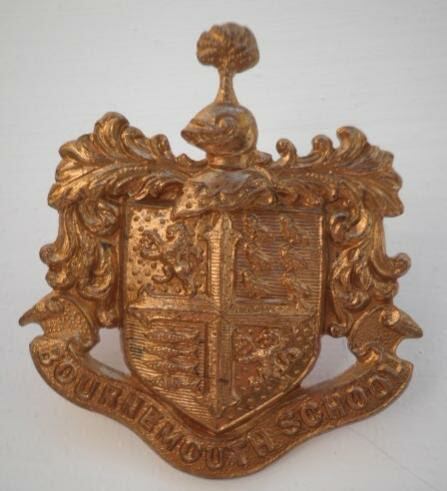 However the crownless Hampshire Regiment badge continued to be worn and issued until old stocks ran out.